I've never been able to rave enough about District B13, the French action film that introduced the world to Taken director Pierre Morel and used parkour better than pretty much any other movie has since. It's not really the kind of movie that begs for a sequel, being that it's a short and sweet 80 minutes long and ties everything up at the end. But now that a sequel exists, I'm not going to complain. 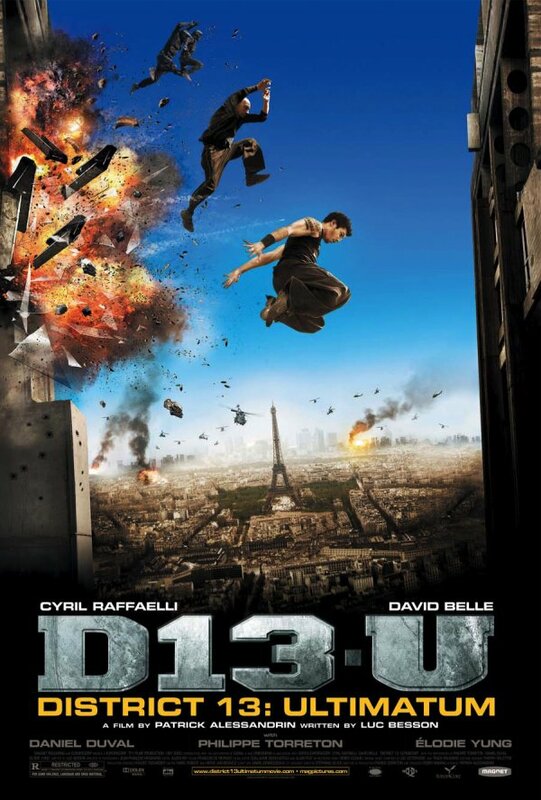 District 13: Ultimatum has Cyril Raffaelli and David Belle returning in the lead roles as the reformed gangster and the cop trying to keep the peace in the notorious B13, where gangs still rule and, once again, there's a threat of the government simply wiping the whole place off the map. It's not directed by Morel, which is a disappointment, and let's face it, it's not likely they'll once again capture the same level of schlock magic. Still, it'll probably be mighty fun to look at. Below is the full synopsis, and below that, the full poster. District 13: Ultimatum comes out VOD on January 1st, and is in theaters February 5. Two years have passed since elite police officer Damien Tomasso (Cyril Raffaelli) teamed up with reformed vigilante Leito (parkour originator David Belle) to save the notorious District 13, a racially charged ghetto populated by violent drug dealing gangs and vicious killers. Despite government promises to maintain order, the state of the district has deteriorated, and a group of corrupt cops and elected officials are conspiring to cause civil unrest in D13, looking for an excuse to raze the area and cash in on its redevelopment. Now Damian and Leito must join forces again, and use their mastery of martial arts and their unique physical skills to bring peace to the neighborhood by any means necessary… before a proposed nuclear air-strike wipes it off the map. With bone crunching fights and death defying leaps, this adrenaline charged sequel takes the groundbreaking parkour action from DISTRICT B13 to thrilling new heights. District 13: Ultimatum is the fourth film in Magnet Releasing’s “Six Shooter Film Series V2,” a series of six films focusing specifically on action cinema, featuring some of the most exciting action films available today from around the globe. District 13: Ultimatum will be preceded by RED CLIFF, ONG BAK 2: THE BEGINNING and BRONSON, with two other films to follow over the coming months including THE WARLORDS.